A lesbian relationship is destroyed by sleep-drawing and supernatural possession. Move over cat lady… because we have a chicken lady in this one! We are introduced to Addilyn in a chicken coop, singing to her little chicken. From the beginning, we get a feeling that she weirdly fits right in here. Then enters conflict as her lesbian lover, Cora, mentions she’s found a good home for their chickens. Cora even jokes about ‘cooking’ a roast chicken. None of this sits good with the chicken lady. Not only a great vehicle for conflict, but I believe this little scene is a catalyst that heats up Addilyn’s strange sleep patterns of parasomnia: drawing and even scratching chicken drawings onto the walls of the bedroom! Realizing Addilyn’s symptoms are growing out of control, Cora buys a sketchbook then decides it’s time to call in the shrink, but it can’t be soon enough, because the last night in a manic chicken rage, Addilyn smothers her lesbian lover with a pillow to a choir of clucking chaos. When the clock sounds in the morning, Addilyn rolls Cora over to find a chicken sketch scratched into her face. As Cora lies there dead, a live chicken appears at the end of the bed. Addilyn laughs maniacally. I love the concept. Parasomnia. I’ve always been fascinated with night terrors. Sleep disturbances. It has been done in the movies but not GREAT yet so there is room for one of these! I think it’s marketable, could be festival quality and a great calling card for a writer or director. The Addilyn character would also give an actress a super chance to showcase their talent. – People say never write in pets, but I think chickens would be easy! 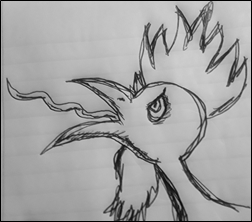 Found myself drawing crazy chickens after reading this… hmmm. Entries (RSS) and Comments (RSS) | 74 queries. 0.240 seconds.